People have said in other Threads they are un-sure on how to get to the PK Server, so I decided to post a Step by Step Guild, including Images, to show you how to get there. There is also a Link on the Main EL website, with some Information you'll need about the Server, it can be found Here. Ok, so lets start explaining how to connect to the PK Server. 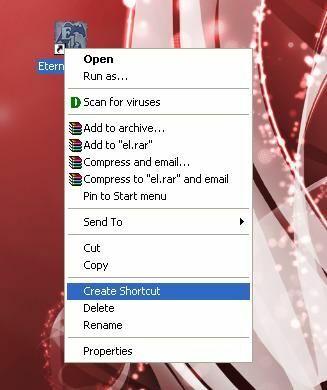 Now you should have 2 EL Icons on your Desktop. Now, Right click on the Icon you just made, and rename it to something like PK Server, or EL PK Server, something so you know that it's the PK Server, and not the main server. 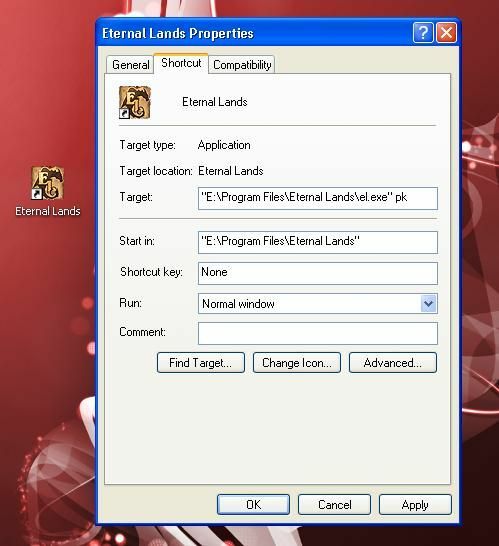 Please note, the location, example: "C:\Program Files\Eternal Lands\el.exe" could change, depends where you have EL installed. Now that should be all finished, click 'Ok' and then 'Ok' again, and all should be done, run the PK Server icon, and see if you connect to the Server. - Some notes, There should be a space between the last " and the pk part, if theres not, it wont work. Well I hope that helped people, if you get any problems post here or Forum PM me. 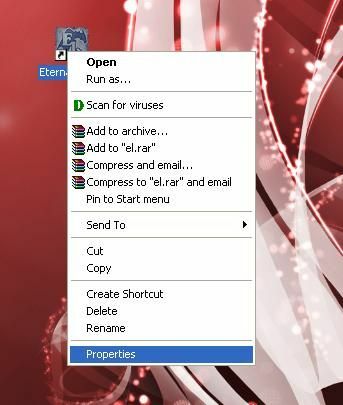 edit - Please note this is for Windows Users only!! Yeah, I was hoping someone would Pin It, maybe it would be a good idea to do a link to the Topic on the PK Server page? So people can know it's here without going through all the Forums. Anyway, pics aren't really necessary, but it does have to be explained in detail. If you can do that I'll pin the topic. Thanks for writing this! Edit: now they're showing up..still is good to write it out in case they don't though. Editting the pics to get rid of the desktop might be good also. Ok guys, thanks for the posts. I think I will re-do the pics, and host them through the EL Forum Gallery, that way they should be shown all the time. I'll also trim down the current pictures to make them smaller. COuld someone possibly update this for non-M$ users? Wouldn't it be the same sorta thing? Create a new shortcut somewhere and add ' pk' to the ned of the target? I'm not sure ofc, only been MS all my life. Btw, I updated the images, and rehosted them on the Forums so they should work all the time. Added some more information to the Step's. I think this could be pinned. Also, I think a Mod could change the Title, and add it's for MS Windows users, not anything else. On Mac you can run it easiest by simply starting Terminal, and typing two lines. First, change to the directory where you have EL, using "cd [the directory]", and to the folder /Contents/MacOS. The directory is usually applications. Thanks for that post, Atlantis. And thanks to the Mod who Pinned the topic. Location:Have u ever been to c6? I haven't seen this mentioned anywhere, but you also have to make sure you have access to port 2002. Hi if anyone can help me. I am trying to create a new character, but it keeps coming up with "Connection Failed! Please try again." If anyone can tell me how to fix it please let me know. Also if it's a port 2002, please tell me how to enable it. Thanks! The instructions in this thread are still valid. My shortcut is setup just as described above. Unless you have a router of firewall that's specifically blocking the 200x ports, you shouldn't have to do anything special to enable it. Thanks it started working after about 20mins of Entrophy's message saying it's done. Sorry I didn't get around to posting until now. I think MAYBE you just have to wait a few minutes? I don't know.